Perón became president in 1946. Perón’s politics was a populism of the right, which drew its support from lower middle classes. He was strongly influenced by Mussolini, with the difference that Perón sought to co-opt and empower labour and trade unions rather than repress them. His wife Eva became an icon. Perón drew power to himself: he quarreled with the Catholic Church. In 1955 the army moved against him and he was exiled to Spain. Allowed to return in 1973, he was elected president but died in less than a year. He was succeeded by his third wife, Isabel, but soon after the army stepped in again. 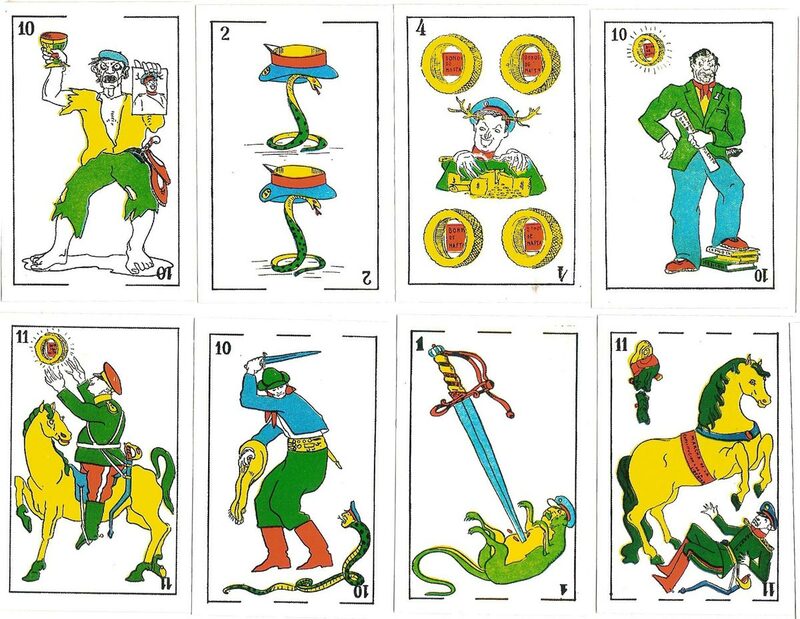 Above: cards from la baraja ‘Popular’, a 48-card pack featuring Juan Domingo Perón on all four 12s, issued at the time of Perón's election campaign in 1951. 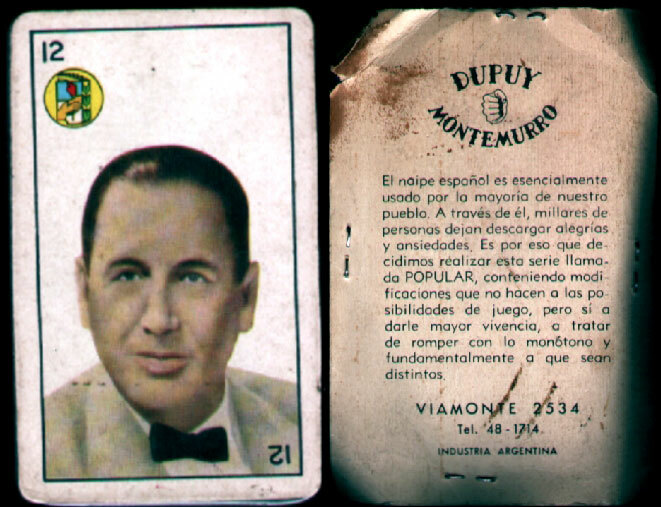 The reverse shows silhouettes of Juan Domingo Perón and his wife Evita. 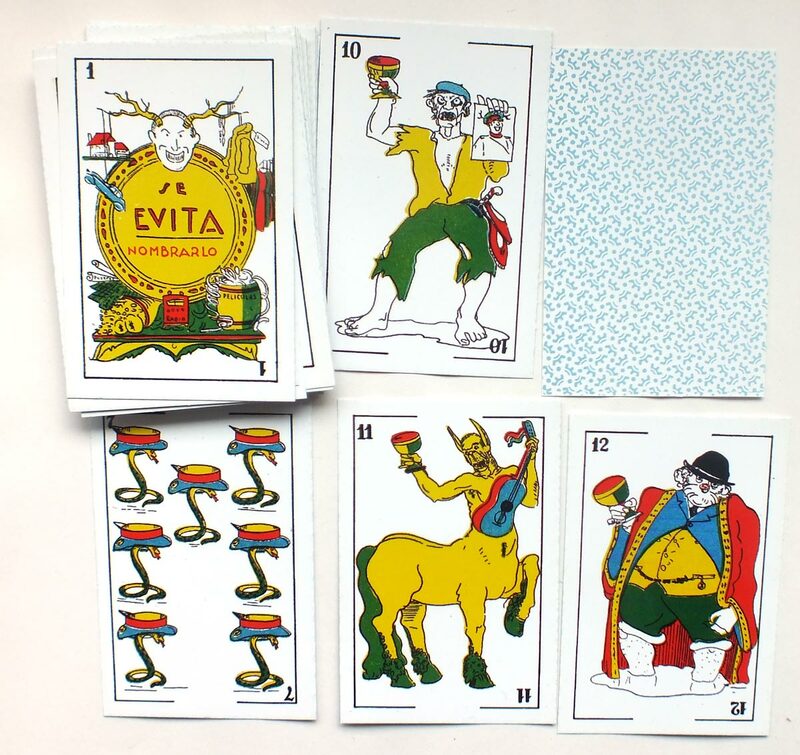 The symbolism in the pack reflects Perón's political agenda, including solidarity with workers and gauchos as depicted on the Jacks and Cavaliers. 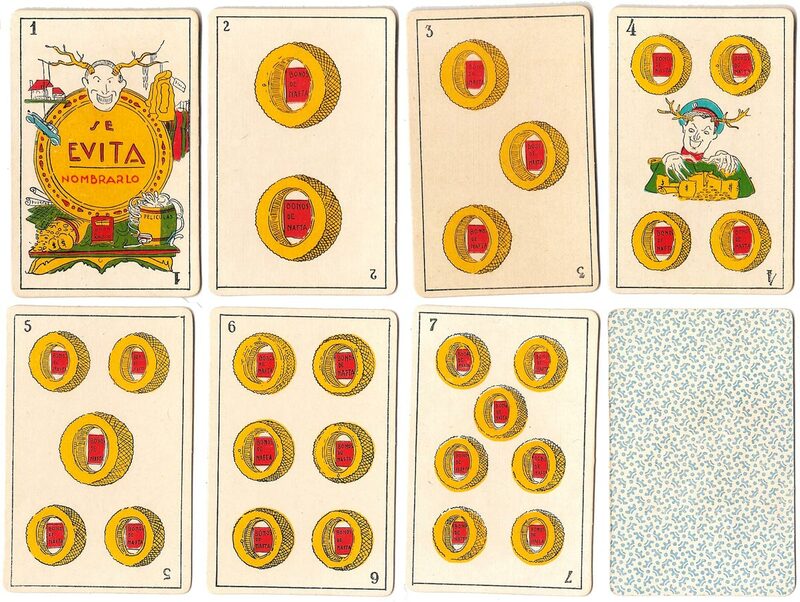 Above: four cards from the reproduction of the anti-peronist playing cards deck published by Juan José Ruiz. The 12 of batons shows Perón wearing a mask. The 10 of batons depicts a corrupt bandit-officer of the Perón administration. The ace of cups depicts victims of the 1944 earthquake and military personnel greedily hoarding money and property which had been intended to relieve the homeless victims of the earthquake. The 12 of coins shows an official loaded with gold grinning voraciously. Volviendo atràs: el As de Oro se dirige a Evita y sus lujos, que claro... todavìa se rematan sus anillos por valores cientos/millones de dòlares. El Oro sigue con los Bonos de Nafta: es una clàsica alusiòn a una coima gigantesca, propia de època. Y de la cual nadie me comentò verbalmente, ni encontrè en Google. Luego en otros se alude directamente al respaldo dado por una parte del Ejèrcito Argentino a Peròn, pero con claras alusiones que el Gaucho no lo respaldaba. Borrachos de ALTÌSIMO NIVEL, y otros DE BAJÌSIMO NIVEL (entendiendo que son caricaturas) lo respaldan a Peròn. Pero... el As de Copas no alude; directamente plantea el gran terremoto en la Provincia de San Juan, y la gran colecta nacional que se hizo, donde se reuniò importantìsima cantidad de dinero. Claro... despuès no llegò a San Juan el dinero, segùn la caricatura. Hay un individuo que aparece en las Figuras, que al final terminò siendo una simple careta: el General Juliàn Farrell, descendiente de Irlandeses. En alguna baraja, Peròn se saca la careta de Farrell !!! (ademàs, asì lo indican los artìculos). Resumiendo: es una crìtica totalmente anònima, hecha pero con miedo, y ademàs como decìs nunca vista.